The modular V15 plug-in valve. 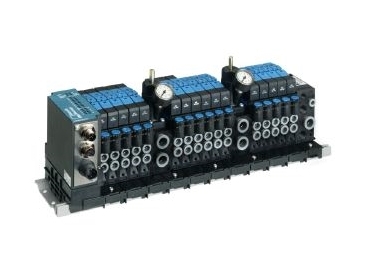 WITH its new variants the modular V15 plug-in valve from Bosch Rexroth can now meet more demands. The new extension stages offer even more versatility to the applications of this valve in machine and plant construction, with the main features of the V15 plug-in being maintained: compact design and high flow rates with a minimum of installation. The 2x3/2-way variant, which will be available with its NC/NC, NO/NO and NC/NO functions, can be installed in a space the size of a 5/2-way valve. In future it will be possible with the V15 plug-in and V15 valve units to install two or more pressure control valves direct. This way different controlled pressures can be realised in a single unit. The controlled pressure can also be removed for use in external applications by means of a separate outlet. The maximum number of plug-in valves per unit has now been increased to 24. A further feature of the V15 plug-in family is the output module integrated into the valve unit. The installation space of a standard valve has two M8 outputs in a single digital output module. This enables externally mounted valves even of other types to be controlled via the BUS of the V15 Plug-in. Compatibility with all commonly used bus systems is provided via a 25-pin D-Sub multi-pin plug. This valve type offers the possibility of diagnostics right through to the individual valve spool. In addition to the 24V and 230V variants already established on the market in future all Type V15 valves will also be available with 110V coils for single connection to sockets.